The theory of an all-pervading physical Aether as forming a 'cosmosphere' by its randomly moving constituents, the 'Aethrons', producing an isotropic static pressure on every point of the Universe. The 'natural vorticity' (Descartes) of this medium creates local rotations in the fluid which are condensed by the pressure and evolve into dynamic matter. The first permanent and encapsulated evolutionary unit is a 'donut-vortex-dipole' equal to the modern 'electron dipole', that continues to evolve in all magnitudes of atoms, molecules, solar-systems, galaxies, etc. 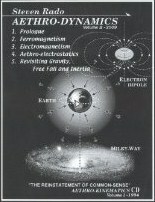 The model of the Aether is based on the simplest form of Newton's mechanics, but declines his 'Universal Gravitational force' by replacing it with a new force due to the 'Evolution of Matter' thru the dynamic condensation of the Aether into subatomic, atomic and molecular systems, encapsulated into units by the cosmic pressure. Thus, 'matter' is the condensation of rotational dynamics of Aether. All evolving matter consumes the cosmosphere and this procedure rarefying the Aether, that is, create a 'suction force' produced by the inhalation of Aether by the cosmic bodies, feeding their internal evolution. Consider the following enigmas of present physics: Galileo's 'Inertia' and 'Principle of Equivalence' , Newton's mysterious identity of 'gravitational and inertial masses' for explaining Galileo and saving his own derivation of the Kepler's formula. Coulomb's negative and positive fluid charges creating the neutrality of matter, instead of Franklin's much simpler an sensible 'one fluid' theory with its 'surplus', or 'deficiency' on the electrified objects. Faraday's mysteriously visible magnetic and electric lines of forces in empty space and Maxwell's inability to build a model of Aether which forces him to a Langrangean mathematical detour and to postulate an enigmatic 'displacement current' without a conveying Aether.? J.J. Thomson discovery of the first subatomic particle, named as 'electron' and defined as a negative? charge carrier in one of Coulomb's two fluids. Rutherford discovered a second subatomic particle, the 'proton' being 1836 times more massive than the electron, but inherits the 'same unit charge' as the electron, but 'positive'. Thus the proton became the nucleus of the Hydrogen atom, with one orbital electron. Einstein demolished all Aether theories, postulated that the speed of light is the limit of the motion of matter and discovered that the 'inertial mass' of an object is increasing when it is approaching the speed of light. His gravitation is not a 'force', but simply an 'acceleration field', that is due to 'the effect of mass on geometry, as it curves? Euclid's straight line motion into orbits according to the inverse square law of action at a distance. 20th century physics finally concludes that protons are imprisoned in the nucleus and could not 'flow' at all, thus the 'electric current' is not the positive fluid of protons as Coulomb suggested, but the negative 'Electron Current'. Nevertheless, the protons are still repelling each other with an immense force of repulsion in the tiny nucleus, therefore, to save the 'electrostatic model of the atom' and Coulomb's whole theory had to be mathematically saved by the newest 'Standard Model' of 'Quantum Mechanics' by postulating an immensely 'Strong Nuclear Force', which is just enough strong to cancel the protonic repulsion in the nucleus but short-range enough to leave a good old attraction field alive to keep the electrons on their orbits at 10.000 nuclei-diameters distance away in empty space...by 'action at a distance'.? All these are described, explained and resolved here by Aethro-dynamics that is also contains a full CD version of the first volume; Aethro-kinematics for detailed history. Aethro-Kinematics is an alternative theory for resolving the perplexities of modern mathematical physics and cosmology. The reinstatement of common sense and classical logic. The simple physics of the third millennium. A dissident alternative to contemporary theoretical physics. Common sense physics for resolving modern mathematical paradoxes. Caroline Thompson - Department of Computer Science University of Wales, UK. "I am not alone in wanting a return of the aether!! If you're prepared to devote serious time to the subject, and realise that what he's talking about is just a model, but one that does have some very interesting properties, Steven Rado has worked out the details of a mechanical model and you must read his book. I haven't yet finished it, but he gives one hope that we may some day learn to understand our Universe intuitively if we can first really understand the kinetic theory of gases. Don't worry, Rado will teach you, by means of careful analogies and beautiful pictures. Could this be how we shall be taught physics in the next century?" "I have found your book on Aethro-Kinematics fascinating and difficult to put down for more than brief periods. In selfdefense, therefore, I have had to skim through parts of it. I have juist finished your "Epilogue, so that I can now put it down and get on with other necessary things, but I expect to return to it for further study and reference. as time goes on. -- Your scholarly, presentation has been informative and interesting in many details. "There is no doubt that, our common idea of a universal aether containing dynamic vortices on every scale and thus accounting for all the mechanical events and relationships in the cosmos, provides a better and more promissinq . prospective for the physical sciences than the conventional ideas which now prevail. We can not know how long it will take for these new concepts to take hold, but when the revolution finally explodes, I am sure that your book and your ideas will have a prominent place in the vanguard." "I received your book a couple of weeks ago and finally have had time to finish reading it. - It's just great. Your knowledge of science and the problems of "modern" science is absolutely overwhelming. Although I can't say that I'm as yet totally convinced of your wonderful Aethro-Kinematic theory, but you have certainly convinced me that you are on the right track. It seems there has to be a medium of transmission of "stuff" through space. Action-at-a-distance violates all our Earthly experience. Of course I couldn't fully absorb your ideas in a single reading. I hope to read your book again in the relatively near future and get back to you with with more comment. "My own test of my understanding is: does it work, can I do something with it, and is it basically simple? -- Aethro-kinematics as you explain it IS simple. I want to do something with it now. "May I state that this book explains to me many phenomena with remarkable common sense. I want to put this precious knowledge to work. The planet needs help to shed the contamination brought about by this fire-society and their polluting fuels. Aethro-kinematics opens the door to new technologies. Your book also deserves mention in New Energy News, the monthly newsletter of the Institute of New Energy." "I have just started reading it and I am completely fascinated by your presentation. The least that can be said about your book is that Chapters 1-4 and 17 constitute a pedagogical masterpiece on modern physics abd the roots of its contradictions. Your review of classical and modern physics is the best of any I've ever read and I've read quite a few on modern physics." "I went into the sink vortex model, the rotational gravitation hypothesis, which really got me hooked. Makes a lot of sense. But still left with the remaining question what causes the sink process and where the aether goes in the center of a mass, being converted into mass or energy or what - you are now leaving me with the additional problem of the tangential component of the aether on the surface of the earth, that has in my mind no basis of experimental evidence! Or does it? I hope you can solve my little problem. I'm looking forward to your response."